Gregg Allman is an American singer-songwriter and musician, best known for his role as lead singer and organist with The Allman Brothers Band. The Allman Brothers Band broke up in 1976, with Gregg parting from his bandmates on bad terms. He was then free to explore a solo career, one which had seen such a promising start in 1973 with Laid Back. 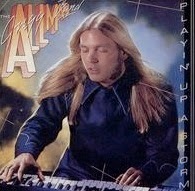 For his next release he put together a new band, and so 1978's Playin' Up A Storm was credited to The Gregg Allman Band. The band itself (which featured bassist Willie Weeks) was also helped out by a large cast of guests, including Dr John, Little Feat's Bill Payne and jazz bassist Red Callender. It was a good album, a collection of R&B and soul based tunes that included Ray Charles' "The Brightest Smile In Town", Candi Staton's "Sweet Feelin'" and Allman's own "Come And Go Blues" (originally from the Allman Brothers' Brothers And Sisters album), plus some good new songs.